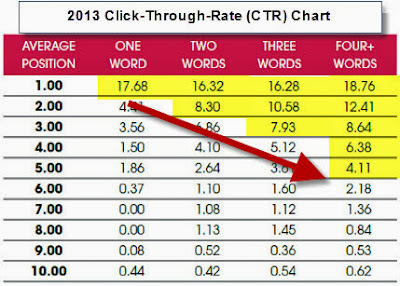 A recent study by Catalyst Search Marketing has followed-up years of Click-Through-Rate (CTR) data to better reflect the recent changes in Google and how rankings compare to CTR. As you can see from the blue chart to the right from 2011, The average CTR for the #1 position in Google was disproportionately higher (36%) than the #2 position (12.5%), the #3 position (9.5%) and so forth. The basic message back in 2011 was it is great to be #1, ok to be #2, and then everything else. Attorney search has become VERY competitive over the past 5 years with a growing number of attorneys coming online meaning greater competition and higher costs per lead. The recent explosion in attorney PPC spending is a perfect illustration of this. The most recent study on CTR by Catalyst provides a new twist to this data since it now shows a trend of most distributed CTR to long-tail search results (unbranded) over branded search. What is interesting when comparing the red chart (2013) to the blue chart (2011), you will notice how being #1 in Google, although still important, is less important now than in 2011. Moreover, showing up in any of the top 3 spots for long-tail attorney search could strongly beneficial. Long-tail search, as an alternative to branded search may have much better Return On Investment (ROI) implications than it did two years ago. In short, if you still adhere to a strategy for narrow term results, you have a much higher cliff to fall from absent the #1 position than you do with a long-tail search strategy. What about the impacts on mobile search? What is absent from this data is the further analysis provided by mobile search which has a far narrower search results footprint. One could argue that the typical one-organic result typically displayed above the smart phone fold could help reverse this trend? Possibly. But right now, we have no further data to support or deny that.What we do have however is the increasing importance of the long-tail and attorney search results. And though obviously appreciative of the effect of blood and gore in movies, he knows there a line between chilling or even disturbing an audience and just being unpleasant. That line of discomfort is drawn closer when women become the targets of violence, and in Hostel Part 2, it obvious that he taken care not to go over that line between the artful or shocking scare (or gross-out) and the outright repellent and offensive. Very amazing topic to talk about. Very timely post. Well said. Content that happen to be designed to enrich web site visitors, article marketing can be mouse clicks to obtain the sufficient variety regarding online business-oriented men AND ALSO women, particularly if for you to simply income an lot more. Arctura, for the reason that it’s a arc. Viewed as the best replica chanel bags tranquil plus pleasing however well-known models, the following arc’s became your bend this appears all those while in the Design. A range, such as; a horizon – essentially it’s extra horizon versus the range. Arc-s imply continuity, wholesomeness plus perpetuity, nonetheless it has the awful in case the curvature attitudes are usually not executed accurately. Care is a natural beauty connected with an arc. Arctura further more elevates this featuring its dazzling strains plus highlighted circular louis vuitton replica. Visiting for a Reduced Variation, a Seiko sportura chronograph changes bolder this occassion featuring its chicness knocked right up by way of quite a few steps. These are typically distinctive as a consequence of Quality and reliability 9T82 (heartcam snap-to-zero understanding, 37 rubies for any chanel replica plus backlash apparatus to get ultra-precision) plus ended up being available exclusively 500 types global, which has an associated with record out of Mr. Shinji Hattori, a Seiko Lead designer. Don’t grieve if you ever not so great from these folks; among the list of 06 several kinds around 5 fake louis vuitton calibers, there’s considerably that they are visited. A further sizeable quality and reliability for any Arctura is a 7L22, which includes a 15-seconds-a-month correctness plus many of the intricacy plus functionality for you to louis vuitton replica potentially ponder on. Government school teachers are getting more salary than the private school teachers. But the pass percentage is too lower than the private schools. Government didn't give more attention to praise the teachers and also punishing then when they are mislead. fine custom essays are produced here for all kind of papers writing and it is very essay from others any writing service providers.